My Paper Trove: Paper Sweeties Sneak Peeks Day Two - New Nest! Paper Sweeties Sneak Peeks Day Two - New Nest! Hi there! The Paper Sweeties Sneak Peeks Day Two is here! I am loving this new set called Sending Springtime! 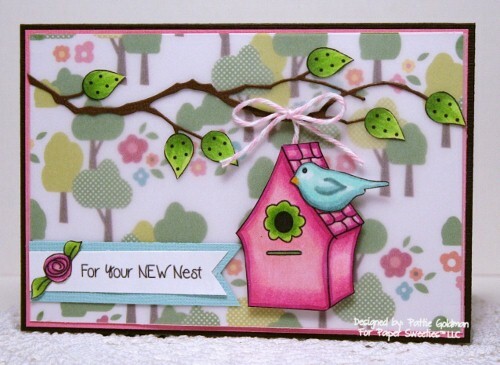 It includes a birdhouse, bird, flower, leaves, a sweet cloud and 7 sentiments! I added a piece of vellum over my dp fading it out and making my images just pop! I colored them with Copics, hung the birdhouse from some twine and added the leaves to this MB die branch. My little bird sits on top of her pretty pink house! I added my sentiment and the little flower image...voila'! Stop by the Paper Sweeties Blog to see what the rest of the Design Team has to show you today! I'm sure you'll be inspired! Thanks for stopping by and come back again tomorrow for May Release Day! The vellum makes this so soft and dreamy! Oh my this is so beautiful!!!! I love it!